I went thrifting with my cute friend Betsy on Saturday morning. It is so much more fun to go shopping with a friend. And then when you find something great, you get to share the squeeling. Which is also awesome. Here’s (some of) what I found. 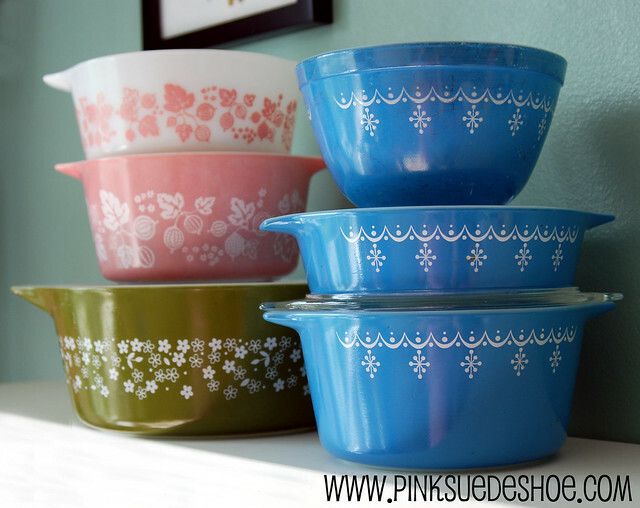 First off, let me point out that I have never found pretty Pyrex at this thrift store. And never on a Saturday. The building is huge, the parking lot is always full of cars and the store is full of scavengers (people like me who go like 8 times a week looking for something specific and awesome.) Tucked on a shelf I saw this little cutie, with the lid for $1.50. Sold. No sooner had I turned around and I saw her little sister for $1.00. And then this little bowl peeking around a bigger uglier bowl caught my eye. He was $.75. 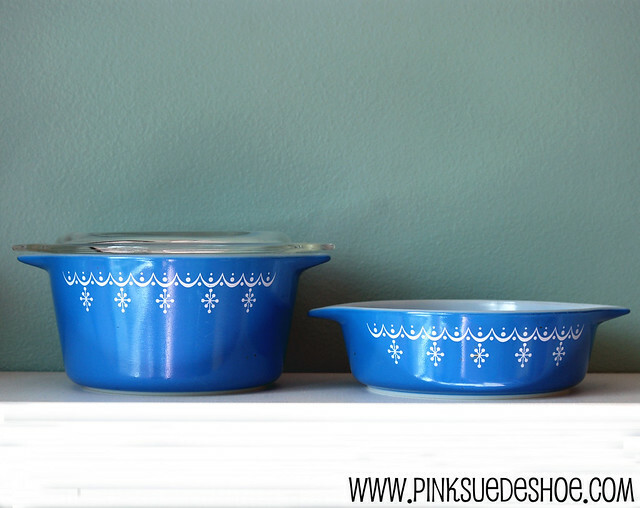 And that makes all three Snowflake Blue Pyrex bowls for a grand total of $3.25. I was a little bit giddy. But that wasn’t all. This is my little, but growing, collection of Pyrex. I only paid $5 for these six pieces. I have one more but it is in the fridge full of leftovers. 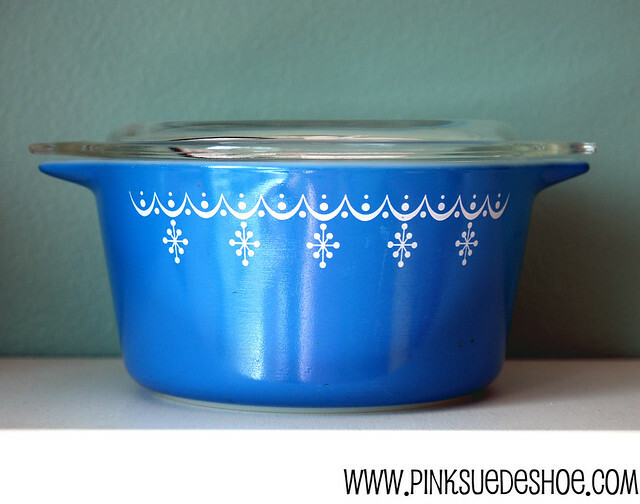 I have posted about Pyrex a few times lately, and I really think it might be my new little crush. It’s pretty, colorful, useful and cheap (you know, compared to Diamonds and Furniture and Typewriters.) I am sure I’ll run out of space before I get tired of collecting it. But I’m just as sure that a lack of space won’t stop me. My little house ran out of space ages ago, but I still seem to find places to put all of the things I love. OMG, I am squeeling here in Massachusetts – what an awesome find and the price is unbelieveable! Jealous….and happy that they found a home where they will be appreciated….. 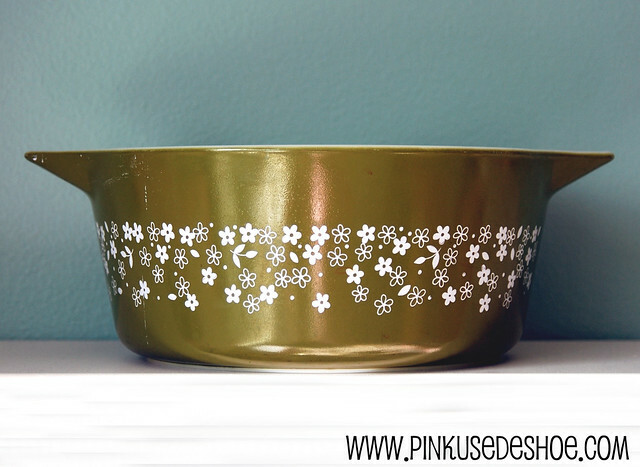 I received 2 of those avocado green pyrex dishes for shower gifts. Both still have their lids and I use them a lot. Can you guess what year I was married in? Oh my – how CUTE those are!!!!! You are so cute and really fun to read. This guy has a few pyrex toward the bottom of the page. But I think your collection is a bit more useful. Oh wow! You totally scored! 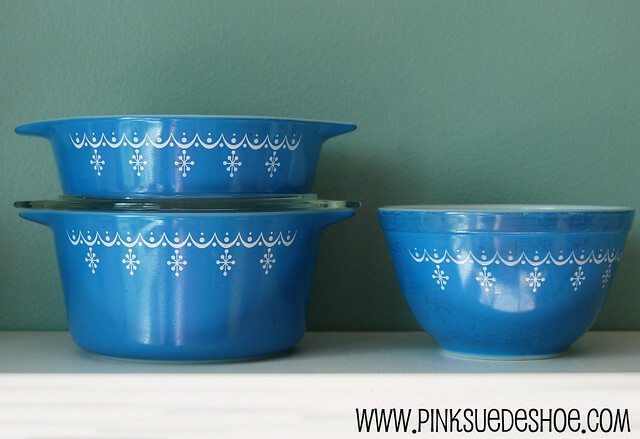 I’ve never seen Pyrex in that color in real life. I love it! And a set of three? Wowsers!